Fort Valley State University’s social and behavioral sciences department will honor outstanding graduates and spotlight the research of exceptional students during a conference. The university will host its 36th annual Banks-Pierro-Rutland-Bellamy Colloquium on Friday, April 8, from 9 a.m. to 2 p.m. The event begins with a research competition between current college students in the W.W.E. Blanchet Computer Technology and Mathematics Building. The culmination of the day’s festivities will be the BPRB Luncheon at noon in the Student Amenities Building. In 1979, FVSU’s social sciences chair, Dr. Donnie D. Bellamy suggested the department launch a colloquium to honor the three men that started the social sciences department: sociologists Dr. W.S.M. Banks II and Dr. Earl Hamilton, and political scientist Dr. Edward Rutland. The first colloquium was held April 25-26, 1980. The colloquium committee voted to add Dr. Donnie Bellamy’s name as an honoree to the event in 1995 upon his retirement. During the morning competition, beginning at 9 a.m., FVSU social and behavioral sciences students will present their papers and poster projects about research subjects impacting the world before a judging panel. Later, the department will host its annual luncheon at noon. Alums from the social and behavioral sciences departments will be honored for their contributions to education, research and scholarship. Select students will also receive a BPRB scholarship covering their tuition for one semester. Attendance to the morning competition is free and open to the public. Tickets to the luncheon are $25 per guest and is available for purchase through April 8, in the Horace Mann Bond Building, room 139. For details, contact (478) 825-6230. 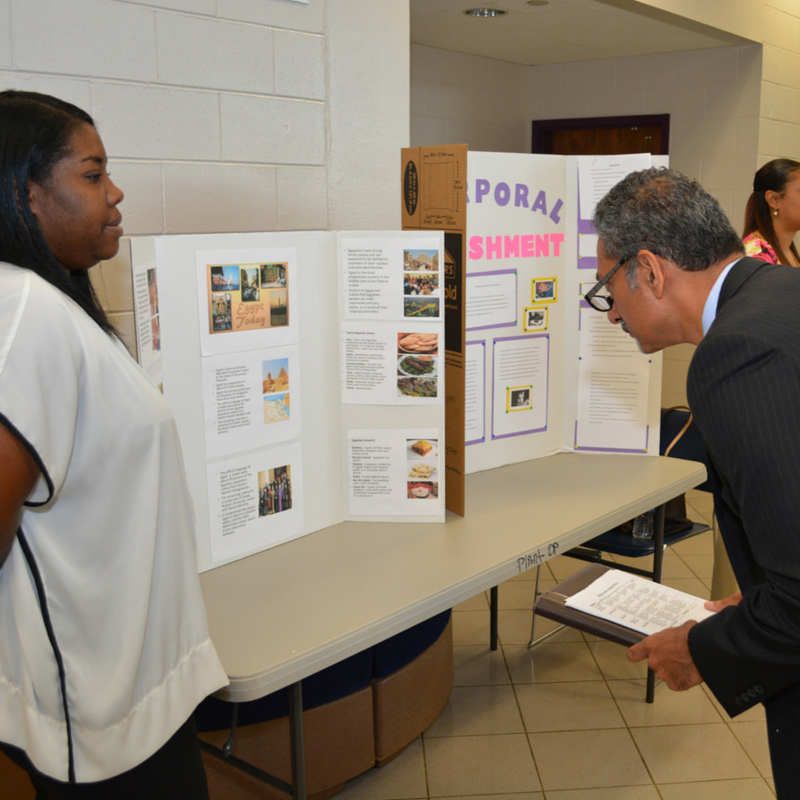 Caption: Dr. Uppinder Mehan (right) reads a student’s poster presentation during the Banks-Pierro-Rutland-Bellamy Colloquium research competition.